Utilizing a silhouette of the ever handsome rescue Aussie, Manhattan (a.k.a. Manny), we have several aussome decals for Aussie lovers. All funds from the sale of these decals will go to Manny's rescuers, Aussie Rescue & Placement Helpline, Inc. (ARPH). 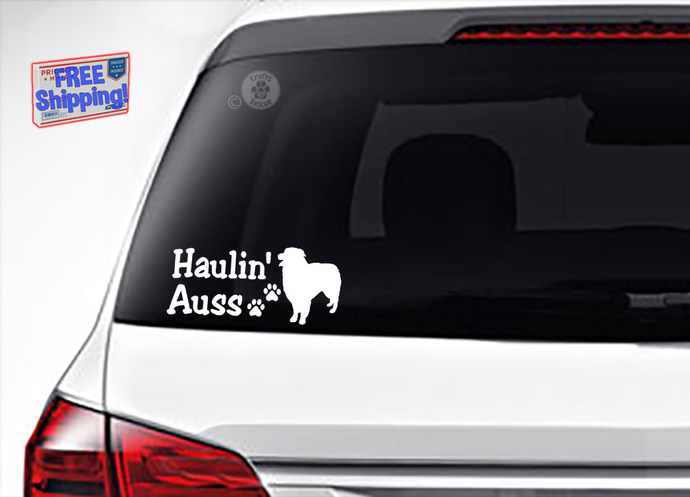 Available in two sizes, our "Haulin' Auss" decals come in a SMALL size of 2.75" high x 6" wide; and a LARGE size of 3" high x 8" wide. These decals are made of permanent adhesive backed white sign vinyl that is flexible, durable, resistant to sunlight, and has a rated outdoor durability of 5 years. (Custom sizing and other vinyl colors also available, contact us). NOTE: This listing is for one (1), matte white, exterior grade vinyl decal as shown in the photo(s).